Nearly 60% of candidates have had a poor candidate experience, and 72% of those candidates shared that experience online or with someone directly. We surveyed 1200 professionals to find out why. We asked 826 job seekers and 374 HR professionals on their thoughts on the State of the Candidate Experience, focusing on each stage–from the application, notification, and beyond– and we found several disconnects between what candidates expect and what employers deliver in the applicant process. The infographic below follows the applicant journey, revealing surprising stats, and the risks and opportunities they present today’s employer brands. 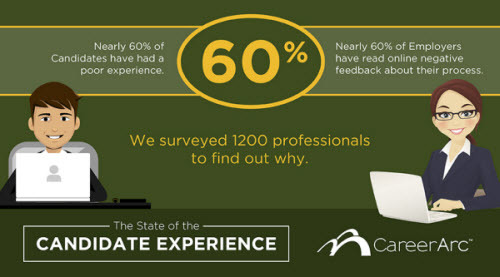 72% of those candidates have shared their bad experience online or with someone directly. 60% of employers have read at least one piece of online negative feedback about their applicant process. While the typical candidate spends about 3-4 hours preparing and submitting one job application, the typical employer spends less than 15 minutes reviewing that application. Nearly 60% of candidates spend at least 1 hour just on research and preparation before they even starting the online submission process. 70% of employers believe candidates spend only 1 hour or less in researching, preparing for, and submitting their job application. 65% of candidates say they either never or rarely receive notice of the decision made on their application from an employer. Of those that do receive notification, 51% say it takes 1 month or more. When they don’t hear back from employers, 85% of Job Seekers doubt that a human being has even reviewed their application. Applicant Screening Software: Nearly 40% of employers rely on technology that pre-screens and/or pre-selects Candidates based on the data they’ve submitted. The 62% majority of employers who use applicant screening tools admit that some qualified candidates are likely being automatically filtered out of the vetting process by mistake. 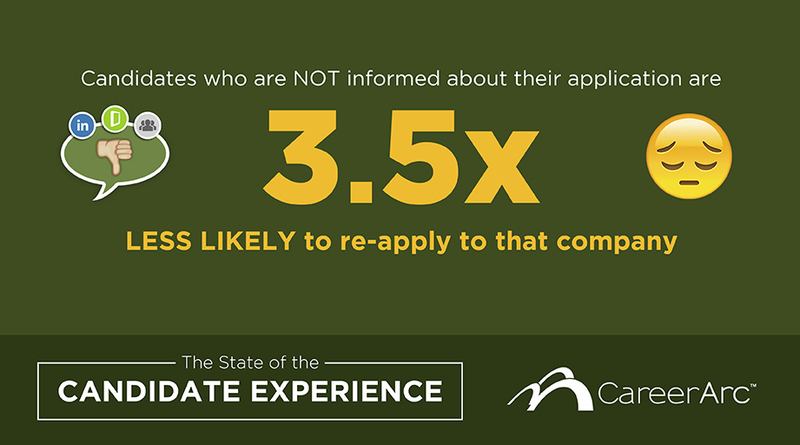 Candidates who are NOT informed of the status or decision of their application are 3.5x less likely to re-apply to that company that declined them. 72% of candidates who have had a poor candidate experience report having shared that experience online on an employer review site or social site, or directly with a professional or personal contact. About 60% of employers have read at least one piece of online negative feedback about their applicant process. While 12% have searched and never found negative reviews, the remaining, 28% have never checked to see if negative reviews exist. Only 1 out of 4 employers regularly request feedback directly from candidates on their experience. 60% of candidates say “Better Communication throughout and after the applicant process,” would make the most positive impact. All the while, 55% of employers think candidates want a better online application or interview process. 99% of employers believe enhancing the candidate experience–for those they hire and decline–could help enhance and protect their employer brand, with 80% of Employers believing it would be Very or Extremely Impactful. 1 out of 5 employers don’t know how regularly they make improvements to the candidate experience. 72% of employers have invested, or plan to invest, more resources to improving the candidate experience in the next year. Considering all the talent acquisition processes that have evolved in the past few decades, it’s interesting to think that the way in which companies reject job candidates has remained fundamentally unchanged. However, the companies who are making an effort to enhance the experience for all candidates recognize that the labor market has changed and will only grow more competitive, and the talent, more scarce. Employers need to consider reframing their rejection process if they want to keep their brand intact in a vocal and competitive talent landscape. Acknowledge each person behind the application by letting them know your decision. For larger companies, notification systems should be automated, but make sure the rejection notice is not robotic – craft the message well to reflect your brand. Give them more than a Thank You note. Re-engage them with future job opportunities that help keep them in your talent pipeline and community. 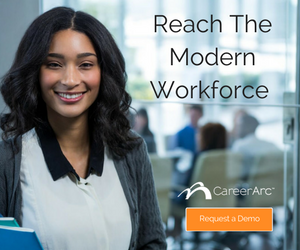 Give them career assistance support, like CareerArc Candidate Care, that will help them find their next job, faster, even if it’s not immediately with your company. Nearly 3 out of 4 candidates said a product offer like CareerArc Candidate Care, a platform which assists candidates in their continued job search, would make a positive impact on their perception of an employer that declined their application. The results of the Candidate Experience Study, conducted in partnership with research firm Future Workplace, were collected between April 11 – 29, 2016. Read the full press release.